(NEW ALBANY, Ind. )—It’s another day in W-430, Organizations and Organizational Change, and Ken Harris, professor of management, is having a blast as a sort of offensive coordinator. Twenty-odd students are divided into groups of four. Each group is pensively centered on a tennis ball. From their laser-like focus, you’d think it was a blinking nuclear device. Harris counts down, and at the “go” sign, the students begin tossing the ball in a pattern they have devised to satisfy Harris’ instructions. After three minutes, Harris calls time, and tallies successful transfers on the white board. Then he changes the parameters. Another ball is introduced. The students discuss how to make it happen, and adjust their technique. They mostly move in, closer together, in order to shorten time required, minimize errors. But it’s definitely harder, and things start to go haywire for some teams, much to Harris’ delight. Three minutes later, new figures are tallied on the board. Some advance, some fall back. Another ball is added. Different individuals are put in charge. Mayhem ensues. And yields to intense concentration and a competitive hush. How did different factors affect group performance? It’s not about the final score. It’s about identifying people and qualities, making adjustments, improving team performance. Now the assignment: the groups will design and execute an activity of their own, and present it to the class–in three weeks’ time. The clock is always ticking in a Ken Harris class. Partly it’s an effort to cultivate a respect for punctuality. Harris is a restless guy, bordering on jumpy. His mind zips around at warp speed, and he admits to having a short attention span. He competes in marathons and triathlons, and it’s easy to imagine that even after wrapping up one of those grueling events, he could deliver a lecture. Or two. Except he doesn’t really do lectures. At least not in the traditional sense, in which the instructor delivers an oration to the class, and then assigns a series of activities to reinforce what was just said. Harris’ classroom is the opposite: a bustling hive of induction that puts the experiment before the interpretation. “We are very activity- and experience-oriented with a focus on getting our hands dirty,” Harris said. Games and team-based exercises mimic organizational survival skills in ways that are fun, dynamic, understandable and, ultimately, relevant. In Harris’ class, bamboo poles, fishing rods, legos, balloons, plastic cups, rubber bands, tennis balls are used to involve students kinetically in a common task—generally competing against another team—that becomes a learning experience. Or they role-play in small groups, or even one-on-one in front of their peers, with one in the role of the boss and the other the employee, with a simple prompt about the basic topic of the conversation. Sometimes Harris will call a time-out and the students will switch roles, or he will call in a different student to assume one of the parts. As the game plays out, students learn to cope with a situation as it presents itself. They learn to collaborate with challenging team-mates, communicate with insecure colleagues, step up or back, yield or stand their ground, give feedback constructively and accept it graciously. “And then they start to think about the implications of the activity,” Harris said. That thinking comes into focus during the debrief that follows immediately upon each activity, and gives students a chance to share their gut-level first impressions about what worked, what didn’t and why. Out of this comes an understanding of the relationship of the individual to the group that shapes the performance of an organization. Once upon a time in the business world, innovation was an option, albeit one frequently frowned upon if nothing was broke. We’re all familiar with the outward trappings of change—the way that, seemingly overnight, iPhones, AI, pumpkin spice lattes became things we can’t function without, and on which our economy has come to depend. But some shifts, no less significant, are more subtle. Generational changes in the mental space are transforming how entire organizations function. That shift has put a premium on the ability of managers to retain talent by including them in conversations about the “big picture” of a company’s vision and planning. Gone are the days of graduation-to-grave loyalty to the firm. Today’s manager needs to address the inner needs of free agent workers, or risk losing them. Employees at all levels don’t just want to work, they want to belong. And for that to happen, they need to be included in a culture of communication that gives them insight into the bigger picture, so that they can see how their contribution matters. “We’ve got more mobility than we’ve ever had before—the average person coming out of college is going to have 11 jobs–so as managers and leaders, we’ve got to be asking ourselves: How do we keep people from leaving, and how do we keep the right people from leaving?” Harris said. That question lies at the heart of everything Harris does as an instructor. Harris believes in the truism: people join organizations but they leave bosses. Anything a person can do to strengthen the organization and become a better boss will be critical to a successful career. Through classroom innovations, Harris is essentially teaching the students not how to stack cups and write with a marker attached by rubber bands to five other people’s hands, but how to become innovators themselves. That is clear during the class assignment, which the students have to design and lead as a team. It may be a decision-making exercise, an icebreaker, a facilitation, a team-building activity, or some other similar proposition. Like many of his colleagues, Harris takes pains to align his classroom experience with the “real world” that students will find beyond the university. But in his course, the concept has a different inflection. For Harris, management is everywhere, and leadership is a state of mind, and part of his job is helping his students recognize that. He starts each class punctually—another touch of real life—with a quick discussion of news items plucked somewhat at random from nonpolitical websites. The stories have one thing in common: they are not “about” management or leadership per se. “Teaching management and leadership, I think everything relates,” Harris said. And so a story about Krispy Kreme donuts naming one of its creations “The Eclipse” for the recent celestial event becomes fodder for a discussion about the wisdom of marketing decisions. A story about a rookie quarterback getting playing time becomes a jumping-off point for a conversation about age differences in an organization. Harris’ focus on the world beyond the campus doesn’t mean that academic enterprise has no value. Quite the opposite. In debates about the relative merits of “book learning,” Harris takes the view that school is every bit as practical as any other endeavor. Harris recognizes that it’s not something he can teach and not adopt himself. As a leader modeling effective management skills, he is obliged to practice what he preaches. This extends into the administrative realm, with a willingness to communicate with students on their terms, maybe via text message instead of during fixed office hours, cognizant of their lives outside of the classroom (90 percent of them work, Harris said). That willingness to exert himself for the greater gain not only sets a tone to be imitated, it infuses his teaching. Hands-off doesn’t mean uninvolved. In fact, Harris would argue that his style requires more work than traditional lectures—and also delivers a greater reward. 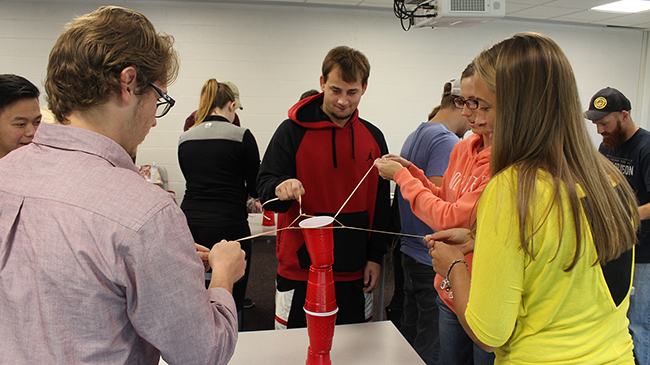 Management students learn collaboration and communication skills through hands-on activities. That unpredictability, and the ability to run with it, goes a long way toward keeping Harris fired-up about his job. He reflects that he has been at this teaching thing for quite a while now, and even at IU Southeast he has been leading the same classes for over a decade. Some might look at this as stasis, but Harris sees it much like the Greek philosopher Heraclitus, for whom the river was the same but the water was always changing. “Every class is different, inputs are different, and how I run this is different, then that keeps it fresh,” Harris said. For example, at some point in the semester, Harris’ students begin to pre-empt Harris’ web captures with stories they have tracked down themselves. It’s a moment to sit back, let things take their course. 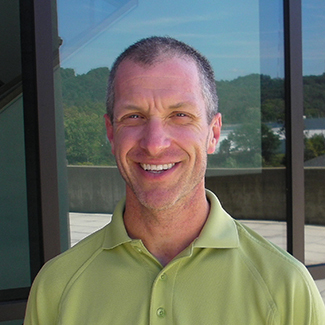 For Harris, teaching is achieving a balancing act, creating a space for learning. It’s something intangible, elastic. There is enough structure so that students feel respected enough, and enjoy a degree of freedom, including a freedom to fail. Tennis balls are dropped, cups topple, and that can be a good thing. That care for the bigger picture of a student’s welfare, not just classroom performance, is a theme that courses through Harris’ career and is reflected in the classroom. A winner of the IU Southeast Senior Faculty Distinguished Research and Creativity Award in 2015, he has served on countless committees contributing to improvement in all aspects of campus life. He has published voluminously in his field, and many articles have found further audiences in mainstream media such as Forbes and online. He has himself worked outside academia, finding success as a consultant for Deloitte & Touche in Chicago, Memphis and Saudi Arabia. That may involve managing expectations. If students and employees expect to be included in the big picture, sometimes they also expect to become a vice president by the time they are 26, and so teaching must balance encouragement and realism. When the projects are presented, Harris is no longer the offensive coordinator. He’s in the back of the room, a bystander, like some guy waiting for a bus. The students are running the show, transformed from undergrads in sweats to organizational team-building experts in corporate casual. On this day, a group has organized an exercise that challenges the other teams to build a tower of plastic cups without touching the cups, using only rubber bands. The second project is a scavenger hunt, with groups assigned the identities of houses from Harry Potter novels. They fan out across campus and locate items on the list, take selfies with the items, and post them to Instagram. There is invention, wit, commitment, inspiration on the fly. And of course, the inevitable debrief. Homepage photo: Ken Harris facilitates a group activity.